A delectable Valentine’s Day treat! Warm the cream over moderate heat until tiny bubbles show and begin to lightly and slowly boil. Add the chocolate and whisk until smooth. Arrange strawberries and other fruit choices on a platter or plates around the chocolate pot. 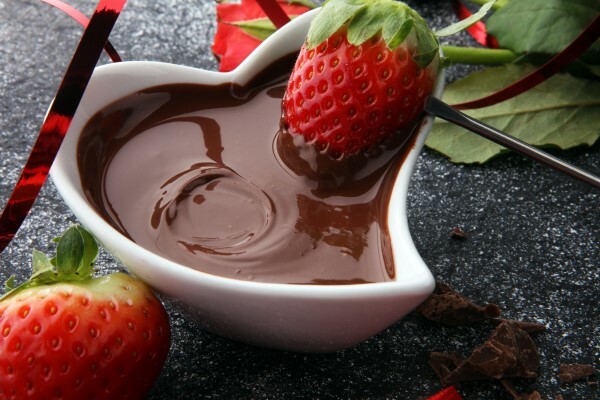 Use a fondue fork, bamboo skewer, seafood fork, or salad fork to dip the fruit pieces into the hot melted cream chocolate mixture. Eat immediately. Sip on a flute of champagne for an evening of pure indulgence!